A busy Holiday weekend gave us four new juvenile graded stakes winners. Gemologist emerged as the horse with the most buzz of the group based on his similarities to 2010 Kentucky Derby winner Super Saver. They not only share the same owner/trainer combo, but also were victorious in the two-turn Kentucky Jockey Club Stakes (G2) at Churchill Downs// Dale Romans is excited with his Remsen (G2) winner O’Prado Again, and thinks the more distance the better// So Brilliant captured the one-turn Hollywood Prevue and will attempt to stretch out in the CashCall Futurity (G1) in three weeks// Outside of the graded stakes, there were also other intriguing juvenile races, particular at the Churchill Downs “Stars of Tomorrow” card Saturday. CTD NP Brown Eyed Jozi romped in an allowance and King Kid impressed in his first try// There’s a fantastic article by Gary West, who now contributes to ESPN.com, on promising early juveniles and their quest for the roses// Holiday shopping is in full swing. Be sure to pick up a calendar for the horseplayer in the family. -Gemologist was very professional in his third start, sitting just off the pace and making a perfect timed move in the stretch. -Pletcher intimated a “similar path” to Super Saver’s will be utilized but whether that means just two preps or also the Tampa and Arkansas Derbys remains to be seen. -What an effort from Ever So Lucky. Wheeled back in two weeks off of his debut, given a 5-furlong breeze 3 days before, and being pressured on the lead throughout the race it was amazing he hung on for as long as he did. His future appears to be just as bright as the winner. -3rd place Timely Tally made a great late charge as did 4th place Optimizer who had to come around the final turn four wide. -The winner seemed to catch a second and third wind at various times of the race, finally using a late burst in the final furlong to win. 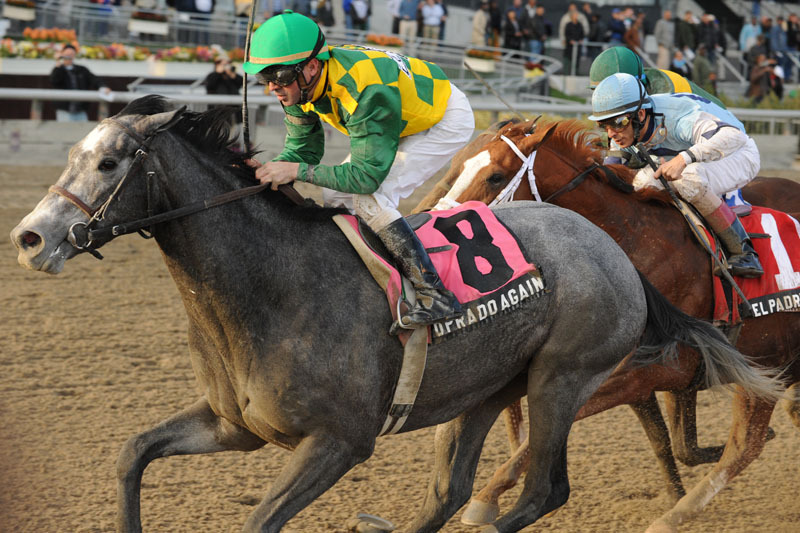 -Desormeaux compared O’Prado Again to 2000 Kentucky Derby winner Fushaichi Pegasus. -Romans says he will take the Gulfstream route to the Derby in the Spring, but before the end of the year could end up in the CashCall Futurity. Let’s hope he takes a break and stays fresh for the Spring. -El Padrino and Done Talking poured it on late but missed. Souper Speedy hung on for 2nd, but really had a perfect trip to steal this one. 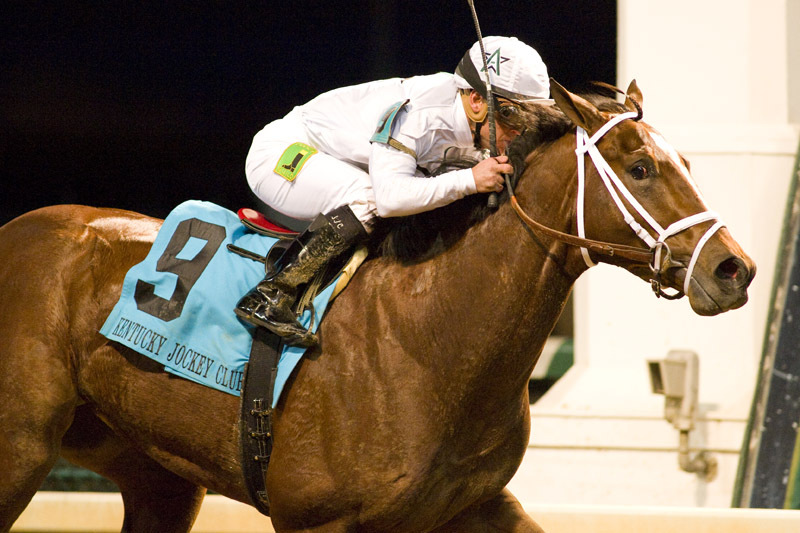 -Winner will point to CashCall Futurity along with stablemate Liaison, winner of the Real Quiet Stakes. -Not much separated So Brilliant and Brother Francis at the wire. The latter had to go four wide. -Sadler hinted he might look at restricted stakes on the main course for Stoney Fleece as opposed to staying on grass. That could lead the way to a try on the Derby trail in the early part of next year, but it’s unlikely. -Second consecutive victory for the short-priced favorite who should step up in class soon. -Son of Songandaprayer, a Derby trail participant who won the Fountain of Youth, finished 2nd in the Bluegrass Stakes, and 13th in the 2001 Kentucky Derby. -King Kid stayed off the quick pace in the early going and used the outside/middle of the stretch to win. -Will be shipped to Gulfstream this week. -Son of Lemon Drop Kid should like stretch-out in distance. Dam was a stakes winner and won on dirt and turf at 8.5 furlongs. -The light bulb went on for Desert Storm late in the race as he made an impressive dash to the wire to finish third.